It’s the second Saturday in June and that can only mean one thing: CITY FLEA! 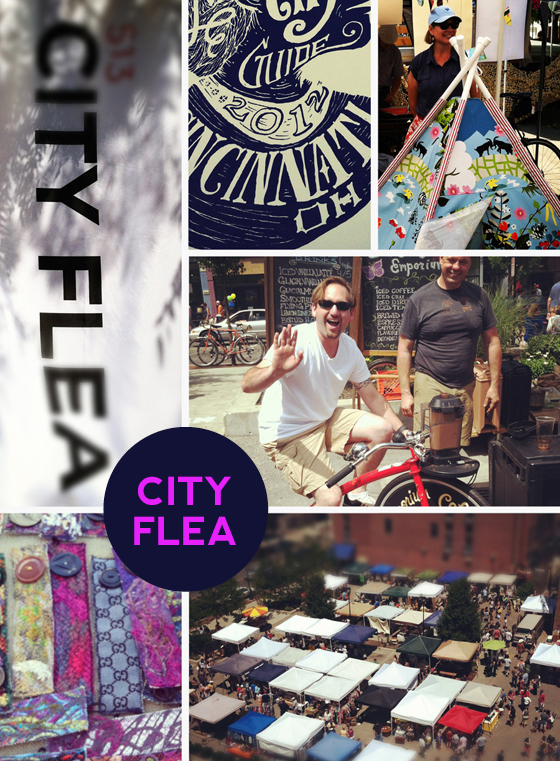 If you live in Cincinnati and you’ve yet to visit the City Flea, you’re really missing out. The good news is you’ll have 3 more chances to catch it this summer at Washington Park! The City Flea is an open market in which creative types, foodies, collectors, etc. sell their goods. It’s kind of a hipster’s playground, but you’ll find all types. The vibe is great complete with a DJ, food booths and really cute dogs. Today, the highlight for me was watching my husband blend his own smoothie via stationary bike at Coffee Emporium. What a sweet idea! Cormier Creative is a proud supporter of the City Flea! We’ve helped all kinds of creative entrepreneurs and artists with their design needs… like City Flea vendor Nancy Stelzer and her small business Hip Huts. You can check out her project here. Fun fun! This entry was posted in Cincinnati and tagged Cincinnati, City Flea, Creative, Hip Huts. Bookmark the permalink. I love the City Flea and your photos are awesome! There must have been thousands of people there!! What a great blogger you are!